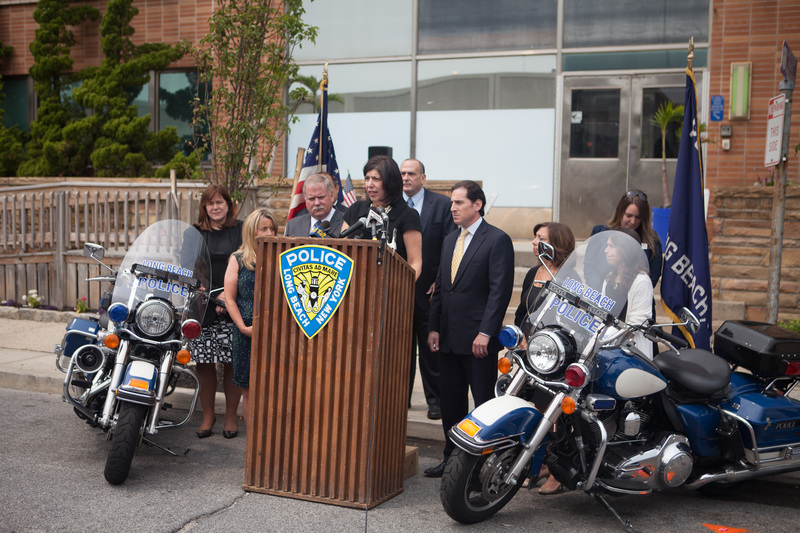 LONG BEACH, N.Y. – Acting Nassau County District Attorney Madeline Singas, Long Beach Police Commissioner Michael Tangney and advocates announced an enhanced drunk driving enforcement program that will go into effect in the City this holiday weekend starting today. This weekend’s crackdown, funded fully by criminal asset forfeiture funds provided by Acting DA Singas and DWI enforcement grants secured by Chris Mistron of the Nassau County Traffic Safety Board, will consist of highly trained, roving Long Beach Police Department patrols focusing on strategic times and locations as well as prevention. The roving patrols will thwart social media applications such as Waze, which are known to be used by drivers to report and avoid static checkpoints. The initiative will be staffed entirely by officers specially trained in field sobriety tests, breath analysis and drug recognition. In addition to pulling over drivers suspected of drunk or drugged driving, Long Beach Police will also be observing patrons leaving bars, marinas and other establishments for signs of possible impairment, and warning them of the consequences of drunk driving or boating.